They’re considered underused tools for identifying food sensitivities and developing individualized nutrition plans. Since Albert H. Rowe, MD, popularized the concept of elimination diets in his book Elimination Diets and the Patient’s Allergies, published in 1941, they became the gold standard for identifying food sensitivities for most of the 20th century. But the introduction of new testing methods has diminished the use of elimination diets. 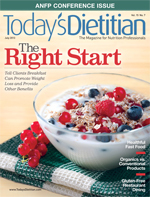 Today, most dietitians don’t use or don’t know how to use elimination diets in their practice. For the most part, the term “elimination diet” doesn’t appeal to many nutrition professionals, but RDs can repopularize this approach to determining food sensitivities and intolerances. Dietitians are the most qualified health professionals to help clients and patients implement well-designed elimination diet protocols to enhance their effectiveness and practicality. Gluten-free, low-FODMAP, and lactose-free diets all represent simple forms of elimination diet protocols that can have a powerful impact on a client’s health, although more complex cases may require a more holistic and global elimination diet approach for optimal results. Despite the lack of research examining the effectiveness of specific elimination diet protocols in alleviating different health conditions, many dietitians have used them successfully to improve many of their clients’ complaints, depending on their degree of motivation. Elimination diets constitute a reliable alternative to food sensitivity testing for identifying nonallergic food intolerances at a low cost. Although elimination diets are available, they require more effort and commitment on the part of clients, so dietitians must use their judgment in identifying the best candidates for this approach. Depending on the practitioner, the protocols used when implementing an elimination diet can vary slightly, but generally they include an elimination and reintroduction phase. During the elimination phase, which should last between four and eight weeks depending on the severity of the client’s symptoms, all potentially problematic foods must be avoided and replaced with safer alternatives. The approach can be adapted depending on the client, says Kelly Schmidt, RDN, LDN, owner of Paleo Infused Nutrition in Chicago, where she specializes in weight-loss and autoimmune disease nutrition. “Depending on the client’s diet before our meeting and their personality and relationship with food, I typically remove foods in phases and not all at once,” Schmidt says. “Yet, when removing all the foods, it’s just as important to educate clients on how to incorporate certain foods to help repair their digestive tract.” Foods that may help repair the digestive tract include bone broth, fermented vegetables, grass-fed organ meat, and coconut oil. “Since there’s no universal safe food, there’s no universal elimination diet,” says Susan Linke, MBA, MS, RD, LD, CLT, a certified LEAP therapist and mentor in Dallas specializing in chronic inflammatory conditions related to food sensitivities, allergies, and intolerances. Depending on the client’s condition, a dietitian may eliminate gluten-containing grains; all grains; dairy; legumes; nightshade vegetables, such as tomatoes, eggplant, white potatoes, and most peppers (eg, hot peppers and paprika but not black pepper); soy; monosodium glutamate; and high-FODMAP foods. RDs should encourage clients to keep a journal during this period to ensure compliance and track any changes in symptoms and overall well-being. Once the elimination phase has resulted in significant health improvements, RDs can assist clients throughout the reintroduction phase, during which eliminated foods are systematically reintroduced into the diet one at a time and every few days to assess tolerance. Any foods that trigger previous symptoms should be considered problematic and avoided. Foods that don’t appear to cause any reaction are deemed safe to reintroduce and can become part of the client’s regular diet, if desired. This is why elimination diets can be a great tool for RDs to customize their clients’ nutrition requirements, which depend on their medical condition and individual tolerance. An elimination diet protocol can lead to symptom relief in patients who have irritable bowel syndrome (IBS), one of the most common digestive problems gastroenterologists diagnose. Although IBS is common, there’s no single approach to help patients better manage bloating, abdominal pain, and abnormal bowel movements. RDs often recommend clients eat all foods in moderation according to tolerance, but it can be hard for them to assess tolerance without more precise guidance. Elimination diet protocols can provide an easy-to-follow step-by-step approach to help dietitians design an optimal diet for clients. Similar to RA, type 1 diabetes is considered an autoimmune disease that may be exacerbated by gluten consumption. Schmidt says some of her clients with type 1 diabetes have experienced more stabilized blood sugar and a decrease in insulin resistance and, in some instances, have reduced their daily number of insulin injections within days of eliminating gluten-containing breads, cereals, granola bars, and even traditional instant oatmeal. Symptoms of type 1 diabetes may be alleviated through the elimination of gluten-containing foods because gluten is associated with abnormal increased intestinal permeability, or leaky gut syndrome, which can result in the absorption of incompletely digested protein and antigens that can overstimulate the immune system through the bloodstream, according to research conducted by Alessio Fesano, MD, a world-renowned pediatric gastroenterologist, research scientist, and founder of the University of Maryland Center for Celiac Research.2 This process, sometimes referred to as molecular mimicry, occurs when epitopes of foreign protein (eg, gluten) circulating in the bloodstream trigger the immune system. In susceptible individuals, this overstimulation can result in the production of antigens against the host, and therefore contribute to the autoimmune process. Elimination diet protocols can be a highly effective and useful tool for RDs to identify food sensitivities and intolerances, and create individualized nutrition plans so clients can enjoy a higher quality of life. Dietitians interested in learning more about elimination diet protocols should read about gluten sensitivity, gluten-containing foods, and various other potentially problematic ingredients in foods such as FODMAPs and dairy to better guide clients interested in taking an elimination diet approach. Becoming a certified LEAP therapist may be another opportunity for RDs willing to make food sensitivity detection the focus of their practice. Because of the lack of current resources regarding the various elimination diet protocols, finding a mentor with relevant experience in your specialty can be another way to educate yourself about this approach. — Aglaée Jacob, MS, RD, CDE, specializes in diabetes education and digestive health, is the author of Digestive Health With REAL Food, and is currently studying naturopathic medicine in Toronto. 1. Childers NF, Margoles MS. An apparent relation of nightshades (Solanaceae) to arthritis. J Neuro Orthoped Med Surg. 1993;12:227-231. 2. Fasano A. Leaky gut and autoimmune diseases. Clin Rev Allergy Immunol. 2012;42(1):71-78. 3. Sapone A, Bai JC, Ciacci C, et al. Spectrum of gluten-related disorders: consensus on new nomenclature and classification. BMC Med. 2012;10:13.